Babymoov's Premium Care is a first-class, low radiation baby monitor that can also be extended if required. "Digital Green Technology" is an innovative technology that ensures clear sound with no interference and low transmission power to keep your child safe and protected. The channels of the Premium Care which has a range of 1400 m, set automatically. If required, you can use the baby monitor in continuous operation or else activate it with your voice (VOX function). The sensitivity of the microphone can be adjusted according to your wishes and needs. The Babymoov Premium Care baby monitor functions with two transmitters (extra tran春節送禮推薦活動產品smitter is sold separately) and thus comes in super handy for monitoring two children. 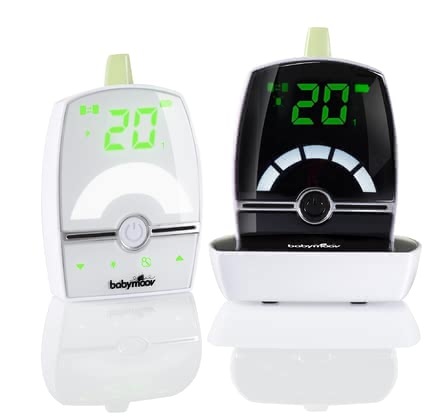 Babymoov's Premium Care baby monitor is equipped with an LCD display with temperature indicator - this way, you can always keep track of things. Thanks to an intercom function you can calm your little one with your own voice whenever it is needed. The parents' unit comes with a practical charging base so that you can connect the baby monitor with the mains quickly. The baby's unit features a calming nightlight.